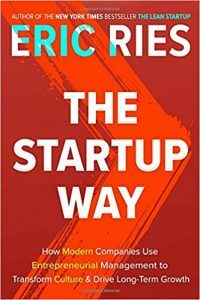 As founders – here at Civilizr and other enterprises like Refinery Lab – we were naturally intrigued to get a copy of Eric Ries’ The Startup Way: How Modern Companies Use Entrepreneurial Management to Transform Culture and Drive Long-Term Growth in the mail. You might know Ries from his previous book The Lean Startup, which transformed startup practice into a truly lean, mean growth machine starting with minimum viable product, focusing on customers and building, measuring and learning all the while. In this sequel, Ries takes a look at larger orgs like Airbnb, Twilio, GE, Amazon and Facebook to lay out principles applicable across all industries and at companies of all sizes. It’s quite true – you don’t have to be in Silicon Valley to be innovative. You just need an organizational structure that encourages rather than stifles change, exploration and growth. The lead-in of the book contains a differentiator between a modern company and an old-fashioned company, and anyone who is or wants to be the former will likely benefit from the rest of Ries’ strategies. With even a foothold in innovation, you can scale and transform your enterprise. This book was provided by Blogging for Books. All opinions are our own.